The US Debt Clock is a “real time” dynamic website that shows the state of the US debt and with a little logic some of what that means to the citizens of this country. What I am displaying is a snapshot of the clock at approximately 9:30 AM Central time on Friday the 18th of January. Unless you are reading this months from now most of the information will probably still be valid. 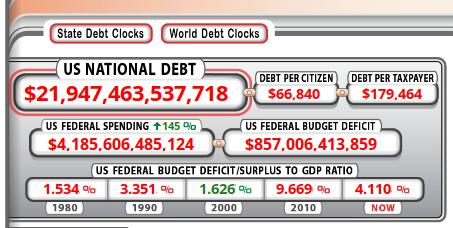 However you can go directly to the Debt Clock and see it “run” for yourself at http://www.usdebtclock.org/. Let’s look at a few of the numbers and see what it is telling us. First in the upper left is the “National US Debt”. According to the “Clock” the United States is almost 22 Trillion dollars in debt. If you place your cursor over this frame on the real time dynamic site you will see that the source for this information is the US Treasury. So in other words 22 Trillion dollars is what the US treasury admits we owe. Some people have actually added up that the US is closer to 43 Trillion dollars in debt, but I digress. What is important to know is that this is the debt that the US (i.e. We the people) owe at this time and it doesn’t include all the added future obligations such as Welfare, Social Security, Government Pensions, etc. Just to the right of the US Debt is the debt the government has obligated to each citizen and then taxpayer. So a baby born in the US is obligated to pay at this time approximately $66,840. Or if it is only spread out amongst the taxpayers then they owe nearly $180,000, and these numbers continually rise. How did we get in such a mess? When a politician wants to win favor from his constituents he/she will offer to pay for some program such as welfare, building a bridge, subsidizing farmers, pay for a expensive military program, etc. anything to get the votes and stay in power. Both sides of the aisle, (Democrat & Republican) and both conservative and liberal are guilty. I must say that while the liberals are wholly sold on spending, the “conservatives” at least give lip service to the idea of cutting spending. So we have a problem and it does not look like it will end well. Basically we have a worldwide Ponsi scheme that mathmatically will eventually collapse. What is the most likely scenario for the future of the US and what should an individual living here do to prepare? To answer the first question is very hard since things could go different directions depending on the reaction of several key players. One key player is the big banks and the central bank. They tend to do everything to preserve themselves at the expense of the average individual even though they were a big part of the reason we are in this situation. A second key player in the reaction is the government itself. Will the government enact laws that protect the individual or protect the big banks? For the last several presidential administrations the laws created have more and more favored the big banks and have set up the individual for the fall. It appears that President Trump is bucking that trend and hopefully will defend the individual over the banks if a failure occurs. Time will tell. Here is another snapshot that you may find interesting. OK, What does “PAPER TO SILVER RATIO” AND “PAPER TO GOLD RATIO” mean? Well that requires us to know a little bit about how gold and silver are predominantly traded these days. Gold and silver are mostly traded through contracts where the owners never touch the real assets, they just sell to others (for a profit or loss). The sell to people that want the asset but don’t want to receive the real asset. That enables some large institutions to create gold and silver on “paper” that doesn’t actually exist. They can sell more gold and silver than actually exists. What these numbers are indicating is that there is over 98 times more gold on paper than actually exists. When we look at silver we find there is over 191 times more paper silver than there is actual silver. What happens when the people that hold the paper gold or paper silver demand the real thing? The price of these commodities should go up to reflect that there is much more demand than what is represented on paper. What should an individual do to prepare for the inevitable collapse of our monetary system? Be food and water independent as much as possible. Store water or have an independent supply. Store food or grow your own. Am I totally comfortable with my preparation? Not at all, I could do a lot more, but I have done some. You should ask yourself what can I do to prepare? Because, the clock is ticking!